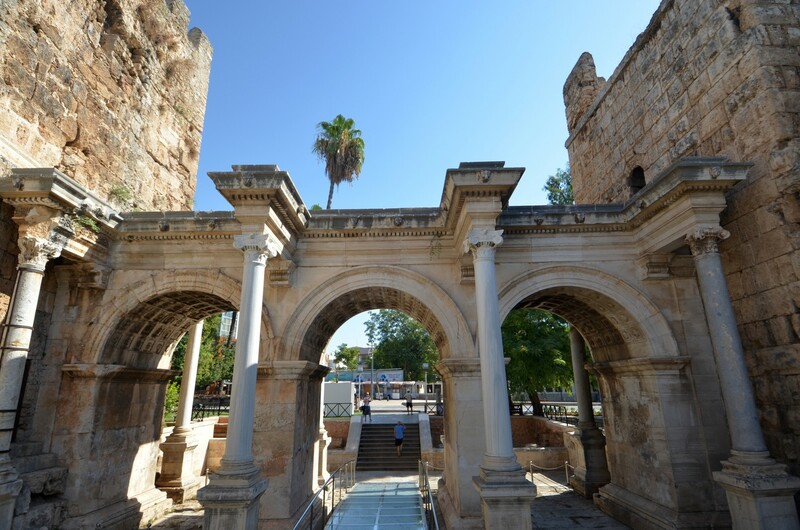 Hadrian's Gate was built in 130 AD to commemorate the visit of Emperor Hadrian in Attaleia, as Antalya was known in this period. 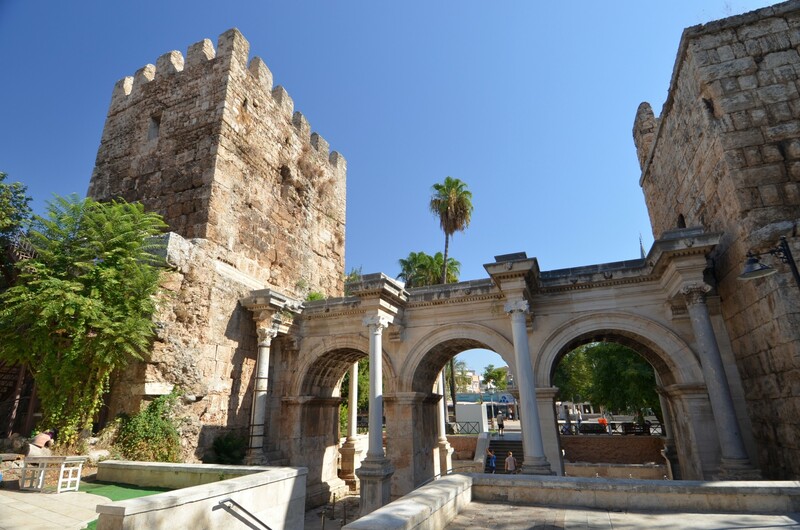 It was incorporated in the walls surrounding the city, and has become a major gateway to the city. 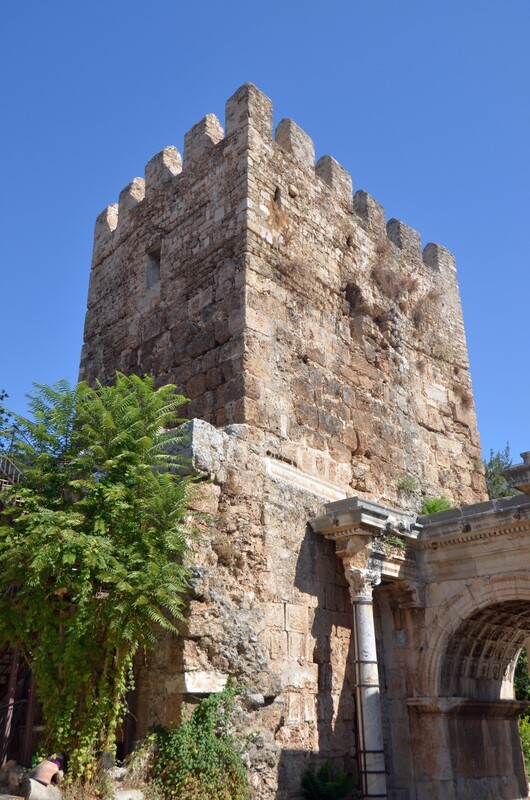 Fantastic stories are told about the gate, like the one about Makeda, Queen of Sheba, who drove through the gate, and then rested in Aspendos, on her way to a meeting with King Solomon. However, there is not a grain of truth in it since these events, even if they had been real, happened in the tenth century BC, and therefore long before the construction of the gate. Two towers, standing on both sides of the gate, come from different periods of history. Southern tower (the one on the left looking from the Atatürk Boulevard) is from the Roman era, but it was, most probably, built independently from the gate. The architectural distinctness of the tower seems to confirm this theory. 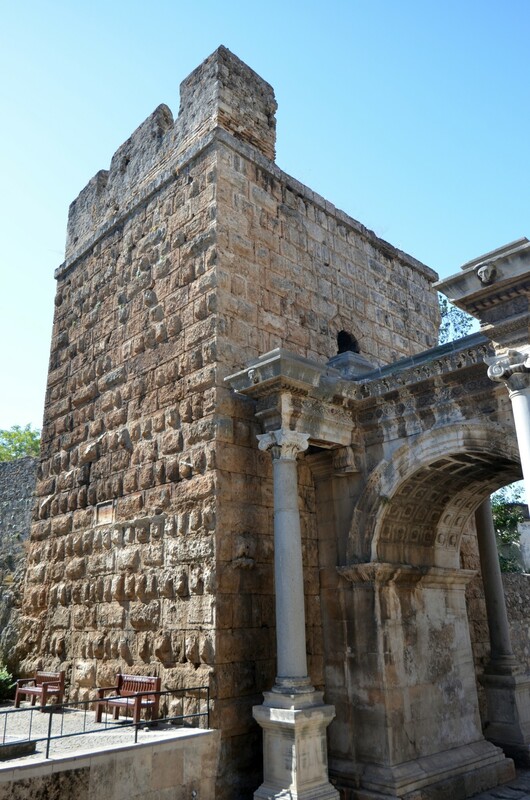 This structure is called the tower of Julia Sancta, and its ancient origins are testified by a stone inscription. The northern tower (on the right) was rebuilt during the reign of the Seljuk sultan Alaeddin Keykubat I, that is, in the first half of the thirteenth century AD. Only its lowest part has been preserved from Roman times. There is also an inscription on this tower, written in Old Turkish language, but in Arabic script. Hadrian's Gate was discovered for the Western world by Francis Beaufort who, in 1817, published its description in his diary of the trip along the southern coast of Asia Minor. This text contains information about a higher level of the gate. However, it must have been destroyed later in the 19th century, as other European visitors to Antalya, Charles Texier (in the 30s of the 19th century) and Lanckoronski, were no longer able to describe its exact appearance. At the end of the 19th century, the state of Hadrian's Gate preservation was described the Polish explorer Karol Lanckoronski in these words: Today it is buried to a depth of several feet, and only visible from the outside, because its internal façade is surrounded by new buildings. The monument is relatively well preserved thanks to the special circumstances i.e. that it has long been obscured by a wall that covered the façade of the exterior and the gap was barely made ​​a couple of years ago. To the same researcher we also owe a precise description of the entire visible structure and its accurate drawings and plans, made by his companion, George Niemann. 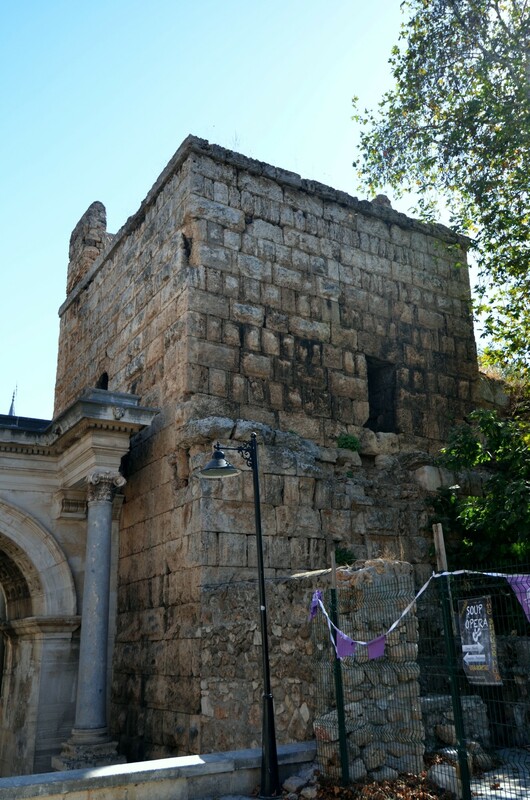 Although it may be hard to believe, the total exposure of Hadrian's Gate and its renovation took place only in the 50s of the twentieth century, over 60 years after the visit of Lanckoronski. Currently, it is one of the highlights of a visit to Antalya and the place where almost every tourist wants to take a commemorative photo. 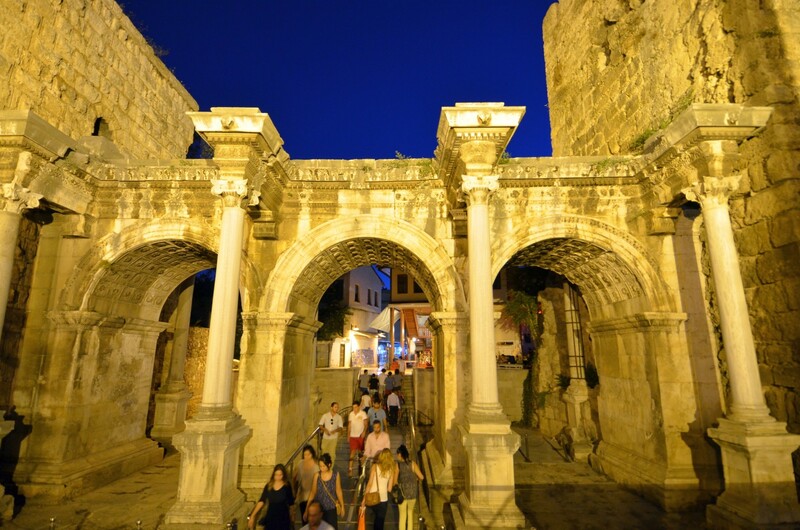 Hadrian's Gate resembles a typical Roman triumphal arch. Its three archways are of the same size - 4.15 meters wide and 6.18 meters in height, measured to the top of the arc. The whole structure has a height of more than 8 meters from the ancient pavement to the top of the entablature. Both the front and the back side of the gate are adorned by the façades, composed of four columns each. The monument was built of white marble, with the exception of granite column shafts. The capitals of the columns are of the composite order, i.e. they combine the volutes of the Ionic order capital with the acanthus leaves of the Corinthian order. 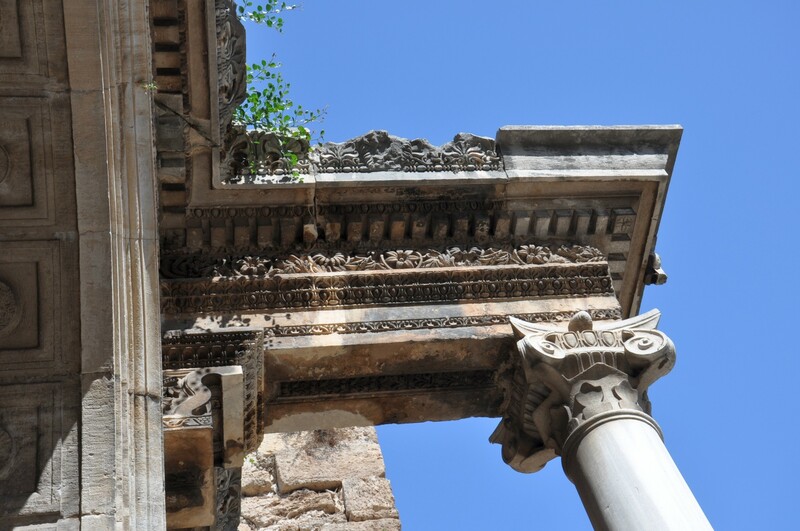 The entablature above the colonnades extending on both sides of the gate has a height of 1.28 meters and consists of an architrave, a low frieze decorated with floral motifs and a cornice. The rich decoration of the cornice represents, among others, the heads of lions. 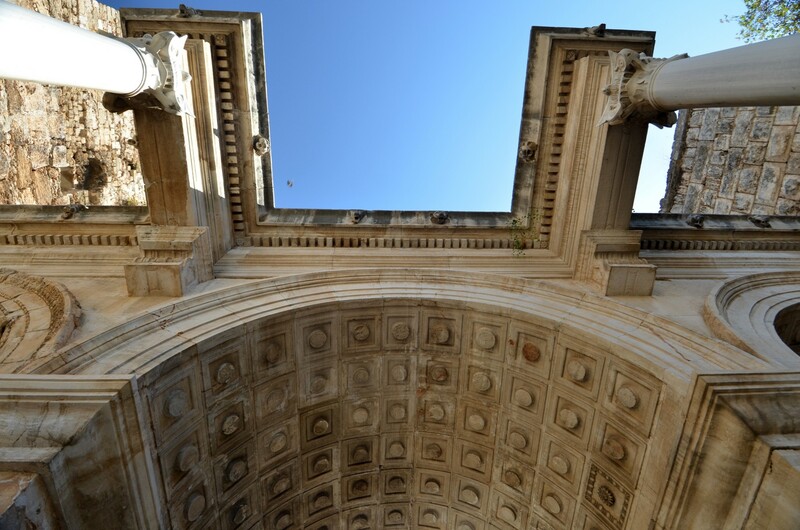 The barrel vaults over the archways are decorated with caissons, each of which has a distinct decoration - floral motifs and rosettes. 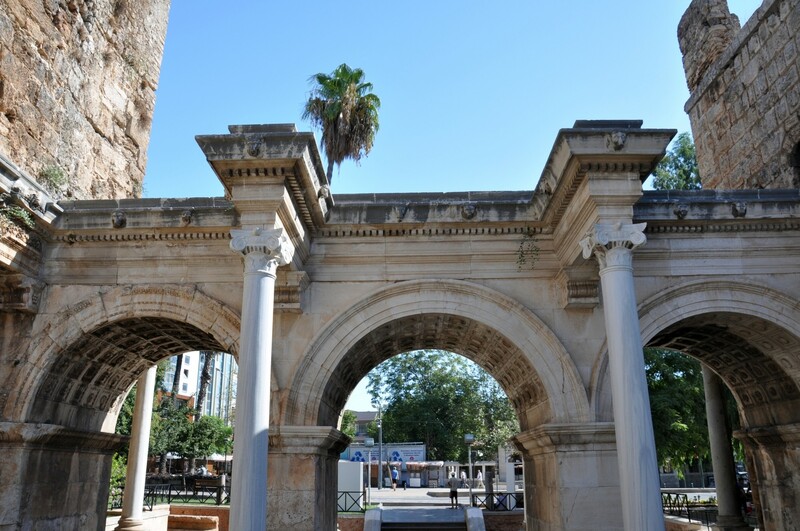 Hadrian's Gate stands by the Atatürk Boulevard, in the centre of Antalya. 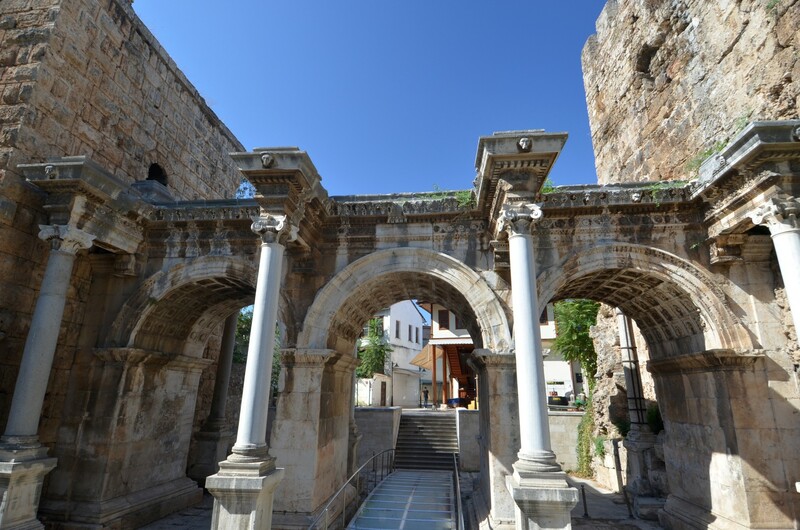 It can be reached on foot, during a walk through by Kaleiçi historical district, or by tram. The tram line (called Nostalji tramvay) runs right by the monument, and the stop is called, fittingly, Hadrian.